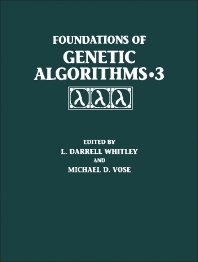 Foundations of Genetic Algorithms, 3 focuses on the principles, methodologies, and approaches involved in the integration of genetic algorithm into mainstream mathematics, as well as genetic operators, genetic programming, and evolutionary algorithms. The selection first offers information on an experimental design perspective on genetic algorithms; schema theorem and price's theorem; and fitness variance of formae and performance prediction. Discussions focus on representation-independent recombination, representation-independent mutation and hill-climbing, recombination and the re-emergence of schemata, and Walsh transforms and deception. The publication then examines the troubling aspects of a building block hypothesis for genetic programming and order statistics for convergence velocity analysis of simplified evolutionary algorithms. The manuscript ponders on stability of vertex fixed points and applications; predictive models using fitness distributions of genetic operators; and modeling simple genetic algorithms for permutation problems. Topics include exact models for permutations, fitness distributions of genetic operators, predictive model based on linear fitness distributions, and stability in the simplex. The book also takes a look at the role of development in genetic algorithms and productive recombination and propagating and preserving schemata. The selection is a dependable source of data for mathematicians and researchers interested in genetic algorithms.